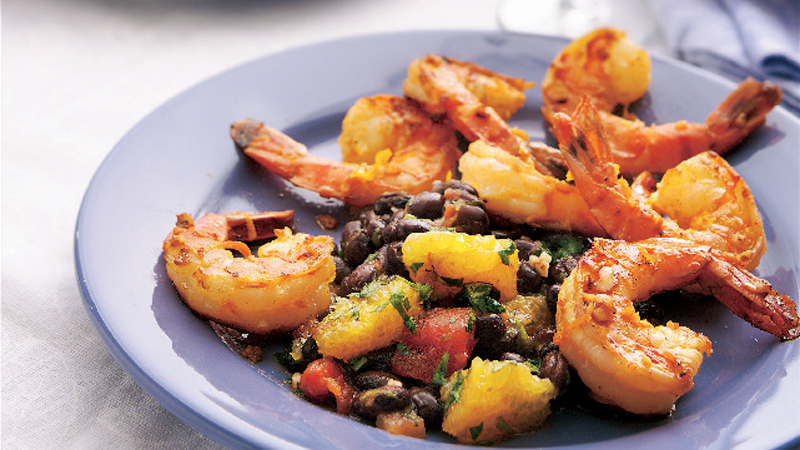 The zesty marinade gives a citrus kick to the prawns and is delicious served with black bean salsa. 1. Place the prawns into a medium bowl with the orange zest, orange juice, salt, garlic, and vegetable oil. Mix to combine, cover with cling film and leave to marinade for 30 minutes. 2. Mix all the salsa ingredients in another medium bowl then cover and leave until ready to serve. 3. Heat a large non-stick frying pan over a medium high heat. Drain the prawns and discard the marinade. Cook the prawns for 2 to 3 minutes, stirring, until pink and golden. 4. Divide the salsa between plates and serve the prawns around the salsa. Serve alongside rice for a fuller meal. Great also served with salad and Old El Paso™ Original Nachips™.